CPSA Dapto Seniors: What a Busy Week (or two)! What a Busy Week (or two)! 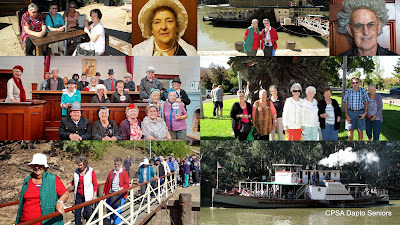 Members have just returned from the club's autumn holiday to Yarrawonga. What a wonderful week they had. The weather was perfect, the food lovely and the organisers took them to some fantastic attractions. Members even took part in an historical re-enactment; it was such fun. Preparations are in hand for the club's spring holiday. Watch this space. The next walk will take place on 2nd May when the group will Explore Historic Wollongong. Catch the 10:20am train at Dapto station (second carriage upstairs) to North Wollongong. The group's leader, Jim, will meet everyone at North Wollongong and explain some of the places the group will visit. Bring a packed lunch or buy fish and chips in Belmore Basin, the choice is yours. After the success of the Kiama walk this is something not to miss. See you there. Just a quick reminder the next club meeting is on the 8th May in the Hall as usual at 10:30 (but remember to be early for a cup of tea and a chat) - there will be a special guest present. Our Federal MP Mr Stephen Jones will address the meeting and hopefully will take questions from members. Tickets for our Mothers' Day Lunch held in the Leagues Club will be on sale at only $15. Don't miss it. Another date for your diary - Dapto Seniors Concert Group's annual Mothers' Day Concert takes place on the 12th May at 1.30pm. There will be singing, skits and lots of fun for all. After the concert the group will serve their delicious afternoon tea followed by the monster door prize raffle - get your ticket at the door, it's free. Why not come along? everybody is welcome - all that is asked is a gold coin donation to help defray some of the expenses. Something to look forward to. The Pots, Plants and Trains bus trip will leave from the Heininger House car park at 8:15am on the 5th May. After the last meeting there were two seats left, ring Ann to see if they are still available - you might be lucky. As you can see it is all go at Dapto Seniors, New members are always welcome. Why not join us? You will be glad you did.